Above all else, Revell has been of interest through his obvious gift for rhythm. Right from Dead Calm, there has been something in his style suggestive of an ear for meter & the pacing of his scores to picture have been impressive indeed. Of late, he has developed a style utilising synth percussion over an orchestral base. David Arnold found himself placed upon a pedestal for his collaboration with The Propellerheads on Tomorrow Never Dies, but Revell has been fiddling with this fusion for some time (as indeed have others). Seemingly back to back have arrived these 2 thriller scores, and with them a sad culmination of that stylistic development. He now sounds just like the others. To whit, he might well be of the Media Ventures ilk, pounding out a very thorough synth mock-up for a film’s producers and then not really needing to do much more. 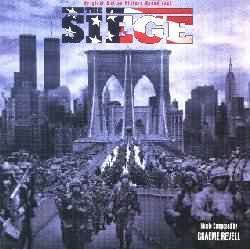 "The Siege" from The Siege (yawn) could be right out of The Rock, The Peacemaker, or Con Air. It crashes and rolls, and you know darn well it won’t be discernible under the film’s own noise. The same goes for "The FBI Building". In "The Blue Bus" some interesting use of volume on tracks distances the percussion from the theme on strings, but here the discs’ other problem arises. The title would seem to have been partly inspired by its similarity to the Speed motif. Should I go into the realms of familiarity ? The opening "The Sheik’s Abduction" has a sampled manipulated keyboard substituted for the guitars that achieved the same effect in Howard Shore’s Crash. "Theatre Bombing" has a shakahuchi right out of any number of Horner scores. "Investigation" has a wailing sample sounding for all he world like Christopher Franke’s Shadow sound effect from the series Babylon 5. To round it off, both "Samir & Sharon" and "Torture" make uninspired use of the duduk. Revell probably didn’t exactly introduce the instrument to the world through his use of it in The Crow, but it certainly caught on. It has appeared in all sorts of guises. Good as in Emil Cmiral’s Ronin, and bad as in Jo LoDuca’s Hercules: The Legendary Journeys. When Revell revisits that sound now himself, it just sounds like a parody of a parody. 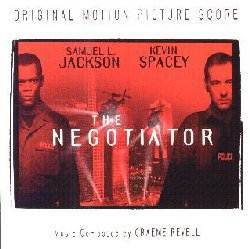 The Negotiator has its share of familiarity too, but is on the whole a better score. "The Second Breach is another sampled noise nightmare, and it was with "Chris Sabian Replaced" that I realised a lot of the quieter sample passages of these scores were reminding me of John Powell’s Face/Off (another Media Ventures score). Try to ignore the referencing of Morricone’s The Untouchables at the end of "Hostage Crisis" too. I did say this was better though, and that proves itself by the "Take the Shot", which is an elegy proper as opposed to "Elegy" which features those pesky Uillean Pipes. It gets elaborated upon in "Escape" by military drums and cymbal. A progression that makes its reappearance in the overture of an "End Titles" very welcome. A one-off appearance by solo guitar giving a lament to the end of "End Game" is also a welcome change of pace. These haven’t put me off his work by any means. The Saint and Fled were two recent scores that more properly demonstrated his skills. Hopefully projects will inspire those heights again soon.